(LEXINGTON) – A 62-year old Kimball Township man has been arrested and is lodged in the Sanilac County jail following an incident in the Lexington Harbor over the weekend. Sheriff deputies were dispatched to the harbor around noon Saturday, after receiving a call that a pickup truck had broken through the ice with a person still inside the vehicle. Bystanders helped persuade the man to exit the truck before deputies arrived. 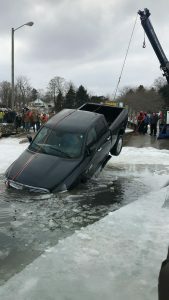 Videos posted on social media show the St. Clair County man exiting the truck and falling on the ice, but then returning to it and crawling back inside it, as the truck sunk in about 12 feet of water. Citizens are shown in the video assisting the man away from the vehicle as the box of the trunk submerges. The man, whose truck went in the water 850 feet offshore, was treated by EMS personnel and then arrested by Lexington police. Dive teams from Sanilac and St. Clair County, along with the Lexington fire department, coordinated a recovery operation Sunday that included using a chainsaw to cut holes in the 14-inch thick ice. After cutting a larger hole in the ice near shore, a tow truck plucked the vehicle from the ice-covered water near the boat launch area of the harbor.